paul gregutt's washington wine blog – unfined & unfiltered: what’s your story? First and foremost, it must be authentic. It must have the ring of truth. It must not feel manufactured. By manufactured, I mean that it wasn’t simply made up from whole cloth by a copywriter. When you see bottles lined on the supermarket shelves, with back label stories about cowboys or truck drivers or wild women in black party dresses, you better believe it has nothing to do with either reality, or quality in the bottle. Second, a good story must be original. It must differentiate you and your products from the rest of the pack. It’s fine to talk about passion, about your special piece of land, about the wonderful people who work at your winery. Go right ahead and do so if you wish. But don’t for a moment think that that will in any way set you apart from thousands of other wineries with exactly the same passion, land and people story. Third, a good story must connect your intended customer/client to your specific brand. Selling wine is especially difficult when it must move through several tiers of the system. Once it’s in the bottle, the battle begins. First it must excite and motivate your distributor. Once past that hurdle, it must gain the interest of the distributor’s customers – the restaurants and wine shops who will purchase and re-sell it. And you are still not all the way home. The retailer must in turn pull that same wine out and get the end customer jazzed enough to buy it. A good story will help all along the way. 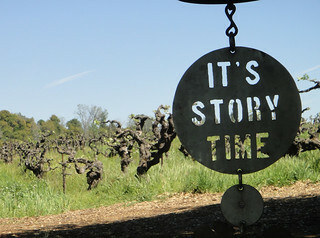 Whenever I write a profile of a winery, I am looking for something to hook to. The quality of the wines is a foregone conclusion; otherwise I wouldn’t bother to write about them in the first place. What else is there to say? That is what I look for every time I write. And that is what you need to look for when designing your own marketing materials, or when presiding over a seminar, or tasting, or winemaker dinner. Tertulia's new Redd brand includes a lovely non-vintage Malbec, a non-vintage Lonesome Spring vineyard Grenache, a 2009 Syrah and a 2008 Bordeaux blend. All four are priced at $15 and sourced from the same vineyards as Tertulia’s more expensive lineup. Consider this Pick to be advance notice – the wines will be distributed by Vehrs but are not yet widely available (they will be soon, I am told). The winery tasting room does not sell Redd wines, and the website lists higher prices. I have been assured by the winemaker that $15 will be the shelf price here in Washington.